It is worrisome to see Governor Mead shift foot in his last budget, from some kind of fiscal restraint back to spending. Hopefully, I am wrong in assuming that this echoes a sentiment from the legislature, namely that the good old days of milk, honey and piles of cash are coming back again. Unlike previous years, where Wyoming faced balancing the state's budget in the midst of declining funds, the October Consensus revenue Estimating Group report anticipated higher revenues coming into state coffers. And that has allowed Mead, in the supplemental request he released Monday, to address issues ranging from state employee pay to creating an emergency account for future governors to use to address issues ranging from natural disasters to increased health-care costs. [The] number is a combination of increased rainy-day funds and a predicted - not materialized - influx of new revenue in 2019 and 2020. ... The entire [$958 million] number is in fact dependent entirely on CREG's notoriously dicey forecasts. Even when the rainy-day fund has grown, its use is contingent entirely on the CREG revenue forecasts. The use of the fund, namely, is as a buffer in case CREG's forecasts turn out to have been overly optimistic. I don't mean to pick on CREG specifically, but given the governor's reference to their October report, I have to point out again that their forecasting is notoriously inaccurate. It is also biased toward optimism rather than realism. no help from the minerals industry for private-sector jobs creation and income growth. Most of the allocations [Governor Mead] approved - about 82 percent - consisted of one-time funding requests, while recurring funds went toward initiatives like pay increases for public employees, whom Mead noted have gone without a raise for six years. State employees have not had a pay raise in over four years ... We are seeing wages increasing in the private sector. Perhaps four years turning into six is just another application of Common Core math. Regardless, there is another creative dimension to this point about state employee compensation: historic facts. If the good governor could present numbers that show that state employees have gone without increases in compensation for four, five, six or fifteen years, I would be more than happy to publish those numbers. In 2017, compensation per state employee was $72,968. There are two things to remember about these numbers, the first of which is obvious: they are averages, not specifics about individual employees. Secondly, they report total employee compensation, which includes benefits. It is possible that Governor Mead refers to the salary part, although if that were the case he would be misrepresenting the earnings of his employees. Benefits, after all, are part of the compensation package. It is also possible that Mead refers to inflation-adjusted compensation. With some generosity, we could give the governor right here: over the past three (3) years - not four or six - average compensation per state employee has increased by one percent annually. That is still bigger than zero, which was what the governor suggested, but it is below established inflation measurements for those years. 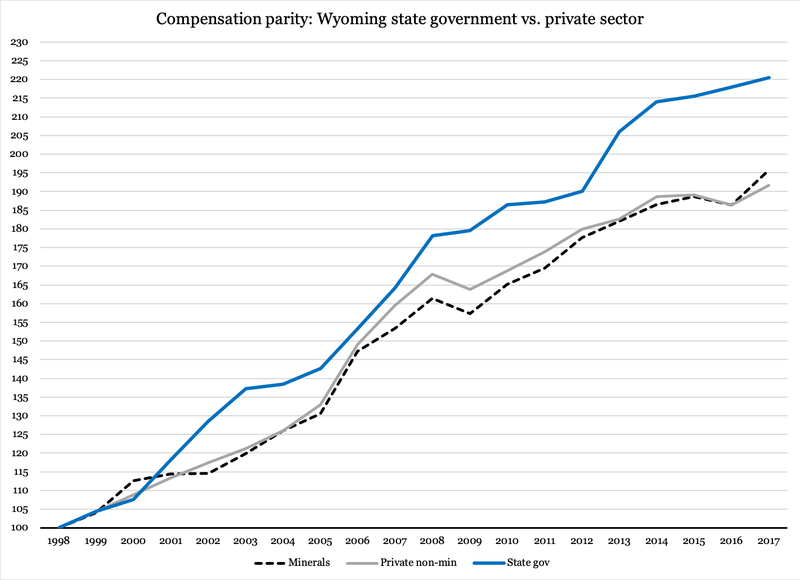 It looks like state government jobs have been comparatively good in terms of compensation. Again, everyone who works hard and is dedicated to his duties deserves an advancement in earnings, but to focus exclusively on government employees like Governor Mead does, is to imply that private-sector employees have somehow fared better than therefore can afford to pay more for government. That simply is not the case. *) Normally, the Bureau of Labor Statistics is the go-to source for this kind of data. However, the BEA breaks down their numbers differently, allowing for separate tracking of wages, salaries and other compensation. That is a preferable method for the purposes of an article like this one.